Assistant captain Patrice Bergeron, and the Boston Bruins headed down to Boston Park Plaza Tuesday for the 8th annual 'Cuts for a Cause' charity event that supports Pediatric Cancer Care with proceeds going to the Boston Bruins foundation and Floating Hospital for Children at Tufts Medical Center. It is an auction event that has fans bid on which players heads to shave with the highest bid allowing that person to shave the players head. 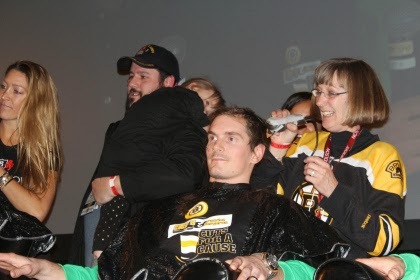 In the eights years that this tradition has brought, this 2015 Cuts for a Cause was the biggest success the Boston Bruins have seen. $130,000 was raised, that being the largest amount in the eight year span. Over the eight years of Cuts for a Cause it has raised $500,000. As Boston Bruins fans we all know hockey players love showing off the flow, and beards to the crowd. Today the crowed that showed up for the meet and greet before hand, got to see it up close and personal before the players heads were shaved. For the Boston Bruins who are usually among the top of that department of silky locks, and bearded men, every Boston Bruins players partook this year, also marking a first for the event. It is a new looking group of Boston Bruins for sure, and was a great way to build some team and fan bonding while also helping those children who suffer from the awful disease of cancer to bring them a huge smile, and supporting them in their battle. Follow @BruinsLife everything Boston Bruins related!